This year's Acadian Remembrance Day on Dec. 13 is an especially poignant one for Archival Intern Renée Belliveau. "I'm trying to unearth and give voice to the underrepresented community of Acadians on campus," says Belliveau, who is working on a year-long project to document Acadian history at Mount Allison. "My Acadian pride has been revived through this project." Belliveau began sifting through yearbooks, newspapers and archival documents in late September. So far she has unearthed several documents and references that point to Acadians' presence and influence at Mount A. 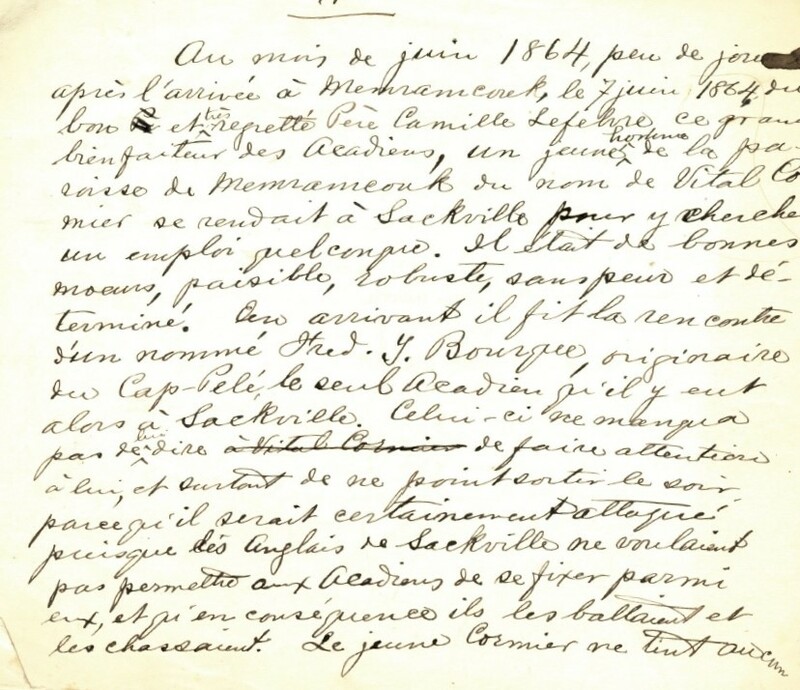 The University Archives holds a small collection of documents from Aurore Bourque, for example, who appears to be Mount Allison's first graduate of Acadian descent. Bourque (yearbook photo, below), who graduated in 1932 with a Bachelor of Arts and an honours certificate in French, became a teacher at the Moncton High School, where she taught from 1940 until her retirement in 1968. It was a trip to the Université de Moncton's Centre d'Études Acadiennes on a search for all things Sackville that led to one of Belliveau's most interesting discoveries: a document from the 1880s that provides an account of an Acadian man coming to Sackville for work in 1864. He was one of only two Acadians in Sackville at the time. The other Acadian warned him about the dangers of being French in what was now an English town. "He essentially told him to be careful because you might get beaten up," says Belliveau. "According to the account, a fight ensued with the townsfolk." The document (excerpt, left) describes how the Acadian man, Vital Cormier, stood his ground and the Anglos liked his pluck. He stayed in Sackville, and by 1887, he had become chief of the M. Abner Smith Shoe Factory. 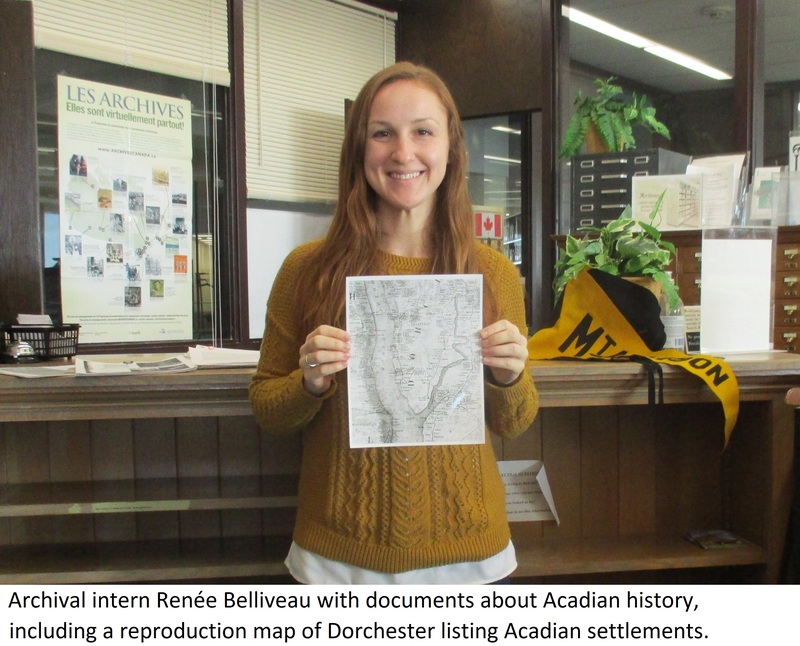 "It was a strange find," laughs Belliveau, who hopes her project will provide a richer point of access for researchers of Acadian history. She will create pages on the University Archives website listing all the information she has compiled, including bio-sketches of the first Acadian students and faculty, a list of honorary degrees held by Acadians at Mount Allison, and links to Argosy articles dealing with Acadian issues. "It will document the Acadian presence on campus as comprehensively as I can," she said. As part of her work, she also plans to interview former and current Acadian students, faculty and staff for the Allisonian Voices project, which documents the history and folklore of Mount Allison University through oral history interviews. The project has personal resonance for Belliveau, who grew up in "a very Acadian and Francophone household," but felt her Acadian identity slipping away as she tried to fit into Anglo culture while doing her degree at Mount Allison. This research has helped restore and strengthen her identity. "As an Acadian and someone who graduated from Mount A, I hope that my research will give former and future Acadians on campus a deeper sense of belonging and pride in how long we’ve been here," says Belliveau. "I want our people to be recognized at Mount A for their contributions to this university." The Acadian Day of Remembrance is commemorated each year on December 13 in Canada, the date of the 1758 sinking of the British ship Duke William, which was carrying 360 Acadians deported from Isle-Saint-Jean (Prince Edward Island). All Acadians except four on board died.